A ketogenic diet treatment for epilepsy was introduced in the 1920’s when researchers at the Mayo Clinic realized that a ketogenic regime mimicked the physiological effects of starvation (1) which had historically been known to limit seizure activity. For a fascinating review of the subject see The Ketogenic Diet: One Decade Later Freeman et al. The KD fell out of favor with the development of phenytoin in 1938 but has re-emerged over the past 20 years, particularly in the treatment of refractory epilepsy (2). Rigid definition and strict oversight of “Classical Ketogenic Diets” for pediatric epilepsy has unfortunately hampered more widespread use as less restrictive, non-supervised versions of ketogenic diets have been used with equal efficacy such as the low glycemic treatment (3) and modified Atkins diet (4). A relatively high carbohydrate ketogenic diet is also possible as long as the carbohydrates are in the form of fiber from non-starch vegetables (5) (6). Not only are seizures decreased in children with epilepsy but improvements were noted in behavior and cognitive functions (2) (7) (8). A great deal of research has gone into the mechanisms involved and widespread improvements in energy metabolism have been documented (9). Mitochondria from animals fed a ketogenic diet produced less reactive oxygen species (ROS), mitochondrial density increased and numerous proteins involved in oxidative phosphorylation increased in the hippocampus in addition to anti-apoptosis mechanisms (8). Neuroprotective effects of a KD have been reported in Parkinson’s disease and Alzheimer’s disease (8). Improvements in Autism have been reported (10) and this is not surprising given the links between Autism, ADHD and mitochondrial dysfunction (11) (12) (13). The benefits of ketogenic diets are not confined to nerve tissue similar improvements in mitochondrial function have been documented in muscle (14), heart (15) and liver (16) and the systemic improvement in mitochondrial function and protein homeostasis are mediated through increased PGC1alpha and NRF2 (16). In an extensive review of mitochondrial energetics Douglas Wallace found that a ketogenic diet is presently the most effective way to treat diseases involving mitochondrial dysfunction amongst which he includes metabolic syndrome and type 2 diabetes (17). Although the ketogenic diet has also been used very effectively for weight loss for at least 100 years (18) and popularized by Atkins in the 1970’s it has not been without criticism. Atkins was demonized by the medical establishment of the time because he was advocating a high fat diet which was thought to increase the risk of cardiovascular disease (CVD). However, epidemiologic studies, controlled trials and basic science investigations over the last 10 years have shown that ketogenic and carbohydrate restricted diets actually improve lipid profiles, CVD risk factors and outcomes (19) (20) (21) (22) (23) (24) (17). Objections to the classical ketogenic diet due to palatability, lipid profile concerns and complications such as constipation can be overcome by consuming the bulk of one’s food in the form of low glycemic plant foods that have a high water, fiber and phytonutrient content but still low glucose availability (20) (25) such as “Eco-Atkins” (5) and a Spanish Ketogenic Mediterranean diet (6) resulting in dramatic improvements in lipid profiles over low fat control diets (26) (27). “Ketogenic” simply implies energy production primarily from fat as a result of minimal glucose availability. The classical ketogenic diet for childhood epilepsy and the Atkins diet are high in fat, very low carbohydrate with adequate but not excessive protein with the emphasis on meat, cream, cheese, etc. but fiber deficiency is a serious criticism of the “classical ketogenic” diet. Grazing mammals are also ketogenic where grass fermentation by intestinal microorganisms produce short chain fatty acids which provide their main energy substrates. What defines “ketogenic” is the paucity of glucose absorption from the products of digestion and the necessity to use fatty acids and ketone bodies for energy. Human evolution over millions of years was from predominantly plant eating ancestors with their dependence on fiber fermentation by symbiotic intestinal microorganisms (20) and recent research suggests short chain fatty acid products of fiber fermentation are vitally important both as an energy source and signaling molecules in intestinal and non-intestinal health (28) and fiber deficiency of the modern diet may be far more important than previously realized (29). 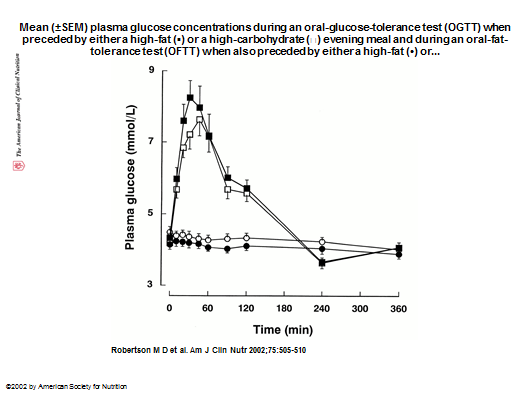 It is important to understand why a small amount, say 50gm of carbohydrate in a mixed meal totally dominates the physiological responses of insulin secretion and fatty acid oxidation (30). As pointed out in the section on the Glycemic Hypothesis of Obesity the free glucose present in extracellular fluids of a typical 60 kg adult female is only around 10 gms, this pool of glucose is easily swamped where we might consume anything up to 200 gm in a meal with bread and potatoes. Maintenance of stable blood glucose levels (80-120 mg%) is of primary importance for which the body has powerful mechanisms to withdraw glucose from the circulation after meals but during fasting glucose must be added to maintain normal levels in the circulation and use of glucose for energy in muscles must be reduced. The task of “turning this ship around” falls to the pancreas with aid of the autonomic nervous system where insulin turns off fat oxidation in favor of glucose oxidation and storage whereas adrenergic stimulation and pancreatic glucagon turns on fat oxidation and increases glucose flux into the circulation to prevent hypoglycemia. Because of the paramount need to maintain normal blood glucose during the feasting/fasting cycles the carbohydrate component of the meal must be dealt with first before any fat can be used for energy. Therefore a high fat meal is stored as fat when accompanied by carbohydrate (19). 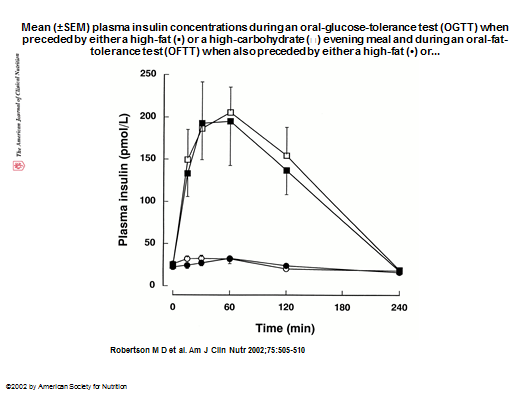 Control of insulin secretion is illustrated in the figures below which show responses to 400 calories of either glucose or fat. The implications for weight control of this priority handling of carbs over fats is that both a low fat/high carb or a very low carb/high fat diet can be effective but they work in very different ways and the low carb approach has significantly preferable effects on hunger, hormones and cell signaling (5). Can a Ketogenic Diet Gain Similar Health Benefits as Calorie Restriction? It is generally agreed that over-nutrition is responsible for obesity, diabetes and many age related diseases and it is well known that calorie restriction, even intermittent fasting benefits all of these things. It is thought that prevention of age related diseases by calorie restriction is due to up-regulation of autophagy (31). Autophagy is involved in maintaining the balance of protein breakdown with protein synthesis and recycles redundant, potentially toxic material (32). Sensing mechanisms of nutritional status trigger cell signaling that regulates basal autophagy as survival requires mobilization of body stores during fasting, as opposed to storage of excess nutrients after meals. Fat mobilization (lipophagy) takes place by a process akin to autophagy (33) and mobilization of glucose from glycogen is also accomplished via autophagy (34). Feeding inhibits and fasting stimulates autophagy through the actions of insulin and glucagon respectively and the primary determinant of insulin and glucagon secretion is blood glucose. Insulin and glucagon control autophagy via their opposing effects on mTOR (mammalian target of rapamycin) whereby mTOR activity suppresses autophagy. Glucagon via glucagon receptor activates adenylate cyclase which increases cAMP and activates PKA (cAMP activated protein kinase) which inhibits mTOR thereby stimulating autophagy in situations of fasting. On the other hand glucose stimulated insulin secretion suppresses autophagy via Akt (PKB) activation of mTOR. A ketogenic diet was found to inhibit the mTOR pathway via decreased Akt signaling as well as increased AMPK signaling in the liver of rats (35). Through similar pathways Insulin and glucagon also have a role in regulating mitochondrial biogenesis. Mitochondrial biogenesis is regulated by the master-controller, PGC1 nuclear receptor coactivators. Fernandez and Auwerx (36) discovered how the pancreatic hormones insulin and glucagon play an opposing role in PGC1a transcription. Insulin secretion which by activating Akt(PKB) depresses mitochondrial biogenesis by inhibiting PGC1a transcription while PGC1a transcription is increased via the glucagon receptor-PKA pathway. NRF2: Recent research by Rochelle Buffenstein’s group into the differences between long lived species the naked mole rat with a 40 year maximum life expectancy compared with 4 years in their short lived relatives, focuses on their superior detoxification and repair abilities largely mediated by the master controller NRF2 (NFE2L2) enhancing transcription of multiple proteins involved in cell protection and detoxification as well as chaperones involved in autophagy and protein stability (37). The activity of two master controller transcription factors NRF2 and PGC1a appear to function in tandem, as they are increased by the same environmental stimuli and cell signaling pathways regulating multiple genes involved in autophagy (38) and mitochondrial regeneration (36) respectively. Both NRF2 and PGC1a are increased by a ketogenic diet (16) (9) (24). AMPK Another sensor of cellular energy levels is AMP activated protein kinase (AMPK) functions in a different way to the glucagon receptor activated cyclic AMP activated protein kinase (PKA). AMPK responds to increased AMP/ATP levels that occur with exercise. A recent review highlights a central role for AMPK in disease resistance and longevity (39) promoting transcription of FOXO dependent proteins such as PGC1a and NRF2 while promoting autophagy by inhibiting mTOR. Of particular relevance to the mechanism of ketogenic diets is that insulin signaling powerfully suppresses AMPK activation via Akt/PKB (40) while glucagon activates AMPK by activating CaMKIV (41). The broadest interpretation of a ketogenic diet is simply low glucose availability such that the liver compensates by increasing gluconeogenesis, acetate and ketone body production from increased fat oxidation, this switch in metabolism is regulated by suppression of insulin and secretion of glucagon and the consequences ripple through most cells and organs in the body such as enhanced proteostasis through autophagy, improved mitochondrial function and regulation of inflammation, processes important for healthy aging. There are additional practical and theoretical advantages to a high fiber as opposed to high fat ketogenic diet. 1. Wilder, R M. The effect of ketonemia on the course of epilepsy. s.l. : Mayo Clinic Bull. 1921: 2: 307. 2. Wheless, James W. History of the ketogenic diet. s.l. : Epilepsia, 2008: 49, 3-5. 3. Muzykewicz DA, Lyczkowski DA, Memon N, Conant KD, Pfeifer HH, Thiele EA. Efficacy, safety, and tolerability of the low glycemic index treatment in pediatric epilepsy. s.l. : Epilepsia. 2009 May;50(5). 4. Kossoff EH, Zupec-Kania BA, Rho JM. Ketogenic diets: an update for child neurologists. s.l. : J Child Neurol. 2009: Aug;24(8):. 5. D J A Jenkins, J M Wong, CWC Kendall, A Esfahani, T Leong, DA Faulkner, E Vidgen, KA Greaves, G Paul, W Singer. The effect of a Plant based low carbohydrate (ECO-Atkins) diet of body weight and blood lipid concentrations in hyperlipidemic subjects. s.l. : Arch Intern Med 169: 11 June 8, 2009 1046-1054, 2009. 6. Joaquin Perez-Guisado, Andres Munos-Serrano, Angeles Alonso-Moraga. Spanish Ketogenic Mediterranean diet: a healthy cardiovascular diet for weight loss. s.l. : Nutrition Journal BioMed Central 2008: 7: 30. 7. Peterman, M G. The ketogenic diet in epilepsy. s.l. : JAMA 1925: 84: 1979-1983. 8. Marwan A Maalouf, Jong M Rho, Mark Mattson. The neuroprotective properties of calorie restriction, the ketogenic diet and ketone bodies. s.l. : Brain Res Rev 2009: March 59: 293-315. 9. Bough, Kristopher. Energy metabolism as part of the anticonvulsant mechanism of the ketogenic diet. s.l. : Epilepsia 2008, 49: 91-93. 10. Evangeliou A, Vlachonikolis I, et al. Application of a ketogenic diet in children with Autistic behavior: pilot study. s.l. : J Child Neurology 2003, 18: 113-118, 2003. 11. Cecial Giulivi, Yi-Fan Zhang, Alicja Omanska-Klusek, Catherine Ross-Inta, Sarah Wong, Flora Tassone, Isaac Pessah. Mitochondrial Dysfunction in Autism. s.l. : JAMA 2010, 304, December 1st, 2010, 2390, Vol. 304. 12. Frye, DA Rossignol and RE. Mitochondrial dysfunction in autism spectrum disorders: a systematic review and meta-analysis. s.l. : Molecular Psychiatry, 2011: 1-25, Vols. 1-25. 13. JJ Bradstreet, S Smith, M Baral, D Rossignol. Biomarker guided interventions of clinically relevant conditions associated with Autism and ADHD. s.l. : Alternative Medicine Review 2010: 15: 1. 14. Ahola-Erkkilä S, Carroll CJ, Peltola-Mjösund K, Tulkki V, Mattila I, Seppänen-Laakso T, Oresic M, Tyynismaa H, Suomalainen A. Ketogenic diet slows down mitochondrial myopathy progression in mice. s.l. : Hum Mol Genet., Vols. 2010 May 15;19(10):1974-84. 15. Marta Balietti, a Patrizia Fattoretti,a Belinda Giorgetti,a Tiziana Casoli,a Giuseppina Di Stefano,a Moreno Solazzi, Daniela Platano, Giorgio Aicardi and Carlo Bertoni-Freddaria. A Ketogenic Diet Increases Succinic Dehydrogenase Activity in Aging Cardiomyocytes Potential Protective Role against Apoptosis-Induced Heart Failure. s.l. : Ann. N.Y. Acad. Sci. 2009: 1171: 377–384. 16. Julie B. Milder, Li-Ping Liang and Manisha Patel. Acute oxidative stress and systemic Nrf2 activation by the ketogenic diet. s.l. : Neurobiology of Disease 2010: Volume 40, Issue 1, 238-244. 17. Wallace, Douglas C. A Mitochondrial Paradigm of Metabolic and Degenerative Diseases, Aging and Cancer: A Dawn for Evolutionary Medicine. s.l. : Annu Rev Genet 2005: 39: 359. 18. Taubes, Gary. Good Calories Bad Calories. New York : Alfred A Knopf, 2007. 19. Feinman, Richard D. When is a high fat diet not a high fat diet? s.l. : Nutrition and Metabolism, 2005: 2:27, 2005. 20. David Jenkins, Cyril Kendall, Augustine Marchie, Alexandra Jenkins, P Connelly, Peter Jones, Vladimir Vuskan. The Garden of Eden-plant based diets, the genetic drive to conserve cholesterol and its implications for heart disease in the 21st Century. s.l. : Comparative Biochemistry and Physiology, Part A 136 141-151, 2003. 21. Loren Cordain, Michael Eades, Mary Eades. Hyperinsulinemic diseases of civilization: more than just syndrome X. s.l. : Comparative Biochemistry and Physiology, Elsevier, 2003: Part A 136 95-112. 22. Isken F, Klaus S, Petzke KJ, Loddenkemper C, Pfeiffer AF, Weickert MO. Impairment of fat oxidation under high- vs. low-glycemic index diet occurs before the development of an obese phenotype. s.l. : Am J Physiol Endocrinol Metab. 2010: 298: E287–E295, 2010. 23. Matthew J. Sharman, William J. Kraemer, Dawn M. Love, Neva G. Avery, Ana L. Gómez,Timothy P. Scheett and Jeff S. Volek. A Ketogenic Diet Favorably Affects Serum Biomarkers for Cardiovascular Disease in Normal-Weight Men. s.l. : J. Nutr. 2002: 132:1879-1885, Vols. , 2002. 24. Douglas Wallace, Weiwei Fan, Vincent Procaccio. Mitochondrial Energetics and Therapeutics. s.l. : Annual Review of Pathology: Mechanisms of Disease 2010 5:297-348, 2010. 25. Frank Q Nuttall, Mary C Gannon. Dietary Management of Type 2 Diabetes: A personal Odyssey. s.l. : Journal of the American College of Nutrition. 2007: 26: 83-94, 2007, Vol. 26. 26. Eric C Westman, William S Yancy Jr, John C Mavropoulos, Megan Marquart and Jennifer R McDuffie. The effect of a low-carbohydrate, ketogenic diet versus a low fat diet to treat type 2 diabetes. s.l. : Nutrition & Metabolism 2008 5:36, 2008. 27. Jeff S Volek, Richard D Feinman. Carbohydrate restriction improves the features of Metabolic Syndrome: Metabolic Syndrome may be defined by the response to carbohydrate restriction. s.l. : Nutrition & Metabolism 2005: 2:31, 2005. 28. Canani RB, Costanzo MD, Leone L, Pedata M, Meli R, Calignano A. Potential beneficial effects of butyrate in intestinal and extraintestinal diseases. s.l. : World J Gastroenterol. 2011 Mar 28;17(12):1519-28. doi: 10.3748/wjg.v17.i12. 1519..
29. Slavin, Joanne. Fiber and Prebiotics: Mechanisms and Health Benefits. . s.l. : Nutrients 2013, 5, 1417-1435; doi:10.3390/nu5041417 . 30. J. P. Flatt, Eric Ravussin, Kevin J. Acheson, and Eric Jequier. Effects of Dietary Fat on Postprandial Substrate Oxidation and on Carbohydrate and Fat Balances. s.l. : J. Clin. Invest. 1985: Volume 76, 1019-1024. 31. Autophagy and Aging. David C. Rubinsztein, Guillermo Marin, Guido Kroemer. s.l. : Cell 146, September 2, 2011 Elsevier Inc. DOI 10.1016/j.cell.2011.07.030. 32. Selective degradation of mitochondria by mitophagy . Insil Kim, Sara Rodriguez-Enriquez, John J. Lemasters. s.l. : Archives of Biochemistry and Biophysics , 2007, Vols. 462 (2007) 245–253. 33. H. Knævelsrud, A. Simonsen,. Lipids in autophagy: Constituents, signaling molecules and cargo with relevance to disease,. s.l. : Biochim. Biophys. Acta (2012), . doi:10.1016/j.bbalip.2012.01.001. 34. Glycogen autophagy in glucose homeostasis. s.l. : Pathology – Research and Practice 202 (2006) 631–638. 35. Sharon S. McDaniel, Nicholas R. Rensing, Liu Lin Thio, Kelvin A. Yamada, and Michael Wong. The ketogenic diet inhibits the mammalian target of rapamycin (mTOR) pathway. . s.l. : Epilepsia. 2011 March ; 52(3): e7–e11. doi:10.1111/j.1528-1167.2011.02981.x. 36. Pablo J Fernandez-Marcos, and Johan Auwerx. Regulation of PGC-1a, a nodal regulator of mitochondrial biogenesis. s.l. : Am J Clin Nutr 2011;93(suppl):884S–90S. 37. Viviana I. Pereza, Rochelle Buffenstein, Venkata Masamsetti, Shanique Leonard, Adam B. Salmon, James Meleb, Blazej Andziakd, Ting Yangd, Yael Edreyd, Bertrand Friguete, Walter Ward, Arlan Richardsona, and Asish Chaudhur. Protein stability and resistance to oxidative stress are determinants of longevity in the longest-living rodent, the naked mole rat. s.l. : PNAS March 3, 2009 vol. 106 no. 9 3059–3064. 38. Kaitlyn N. Lewis, James Mele, John D. Hayes and Rochelle Buffenstein. Nrf2, a Guardian of Healthspan and Gatekeeper of Species Longevity. s.l. : Integrative and Comparative Biology, volume 50, number 5, pp. 829–843. 39. Antero Salminen, Kai Kaarniranta. AMP-activated protein kinase (AMPK) controls the aging process via an integrated signaling network. s.l. : Ageing Research Reviews 11 (2012) 230– 241. 40. Suzanne Kovacic, Carrie-Lynn M. Soltys, Amy J. Barr, Ichiro Shiojima, Kenneth Walsh and Jason R. B. Dyck. Akt Activity Negatively Regulates Phosphorylation of AMP-activated Protein Kinase in the Heart. s.l. : The Journal of Biological Chemistry, 2003: 278, 39422-39427. 41. I-Chen Peng, Zhen Chen, Pang-Hung Hsu, Mei-I Su, Ming-Daw Tsai and John Y-J. Shyy. Glucagon Activates the AMP-Activated Protein Kinase/Acetyl-CoA Carboxylase Pathway in Adipocytes. s.l. : FASEB J.April 201024 (Meeting Abstract 995.4).